Beautiful You: Moving to Uni? My 5 Tips For Freshers! Moving to Uni? 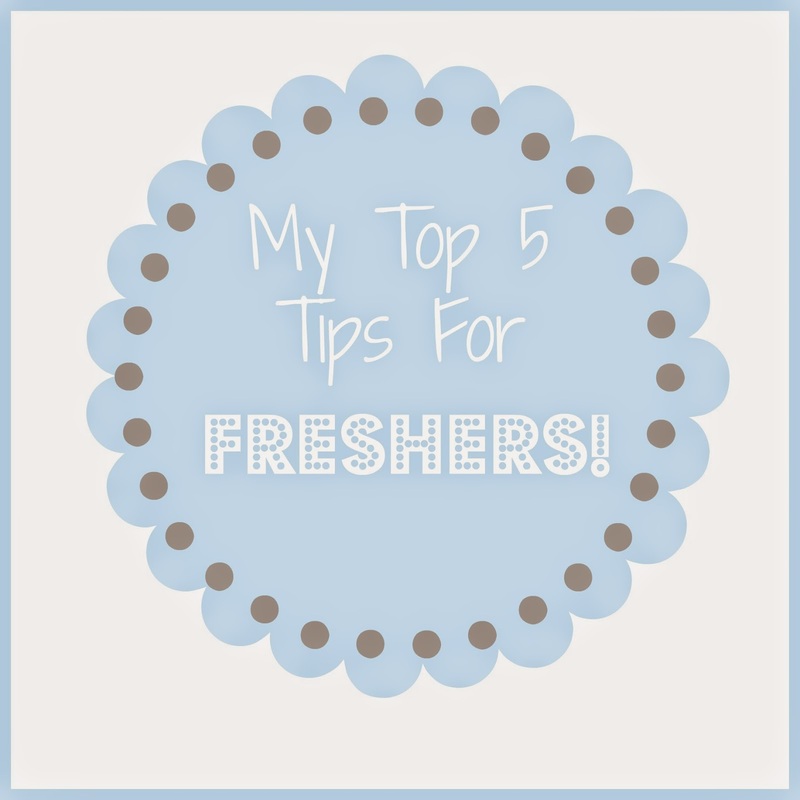 My 5 Tips For Freshers! This week's video on my YouTube channel is about my tips that I would give to freshers for their first year at university. Seen as that is going up on there I thought that I would write a blog post alongside it for any of you guys that are about to start your first years! I can't really talk when it comes to this because I didn't do anything during freshers fortnight but that's because I have anxiety when it comes to going out and I'd rather avoid that! However, many of my flat mates that did go out and participate in the activities had a better experience than I did, I'm not saying I didn't enjoy myself because I had an amazing time but you get more of a well rounded experience if you participate! When you move in I know it is quite an intermediating and nervous time but you have to talk to your flat mates, your going to be living with these people for a whole year so it's not like you can't not talk to each other! It will be no time at all before you all are the best of friends, trust me I didn't think so but now some of my flat mates from last year are some of my bestest friends! Buying shopping for yourself and cooking by yourself can be expensive and boring so like me and my flat mates decided that we would cook together most weekends! I really got on with my flat mates so it was easy for us but just make the effort with them and they will make the effort with you. It definitely makes it feel more homely when you eat all together. Obviously this is going to be a hard one because you have only just met you new flat mates and you have to live with them for the next year so you want to fit in but a text now and again isn't hard. You are going to go home from time to time and you'll want people at home to go and see and for your friend to come and see you at uni because at the end of the day your friends from home have know you longer! I don't know if this will apply to all of you but when I moved to uni we lived in a flat where we all had our own bedroom and bathroom but then we shared a kitchen/lounge. If it is the same then I would definitely say keep your door open when you can because having it shut all the time makes you seem like you don't want to be included. Buy a door stop and wedge your door open and it makes you seem more approachable, people will still knock on your door before they come in but it makes it more homely. Someone maybe feeling a little down and all they need is a friendly face and a chat so it could make all the difference! I hope these tips are useful to some of you if you are moving of to uni, I know I will definitely be taking on board some of my own advice this year! If you are moving I would love if you would leave a comment below telling me what university your going to and I hope you all have an amazing time! I have also made a video on this over on my YouTube channel and there is a link at the bottom of this blog post if you want to go over, watch and subscribe! I will see you all tomorrow for my last blog post of me blogging everyday and we will be back to the normal schedule on Monday! I am going to move next month! So excited!! even though i finished uni last august, this is such a helpful post for new uni people! I need to link this to my best friend who's suffering with freshers flu! She's not coping well! I'm going to uni next year so I'll need to revise these before I go!